Heat oven to 180C/160C fan/gas 4 and oil the inside of a 900g loaf tin. Tip the stuffing mix into a bowl, crumble in the stock cube and pour over 300ml boiling water. Give it a good stir, then set aside. Stretch the bacon rashers a little by running the back of a spoon along their length, then use 6-7 to line the base and longest sides of the tin. Chop the rest. 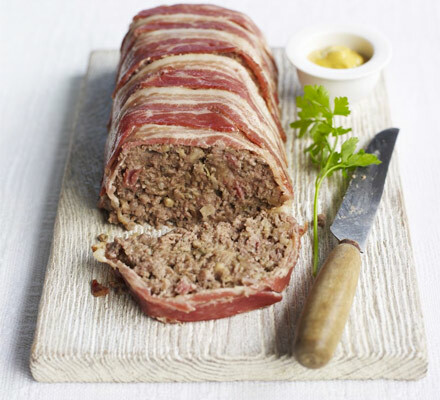 Mix the chopped bacon and mince into the stuffing with some black pepper, then press into the bacon-lined tin and bake for 40 mins until firm. Turn out and serve sliced.